One of my favourite things is photography. I love taking photos of Ref & Serina whether I am using a DSLR, a compact camera or just my iPhone. Nothing beats having artwork created by a professional pet photographer but why not take a crack at creating your own Christmas themed photos this year. It will be a lot of fun and in the end, you will have some photos you can cherish for years to come. 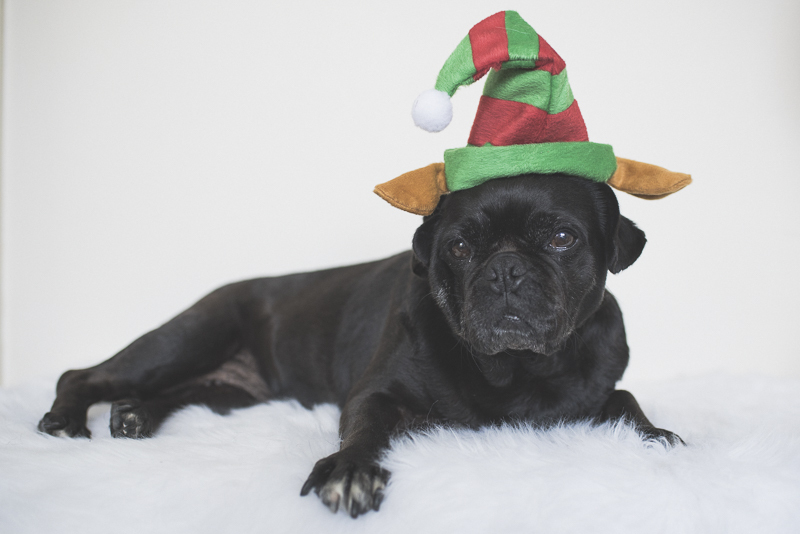 Here are some tips for taking Christmas photos of your pug at home. 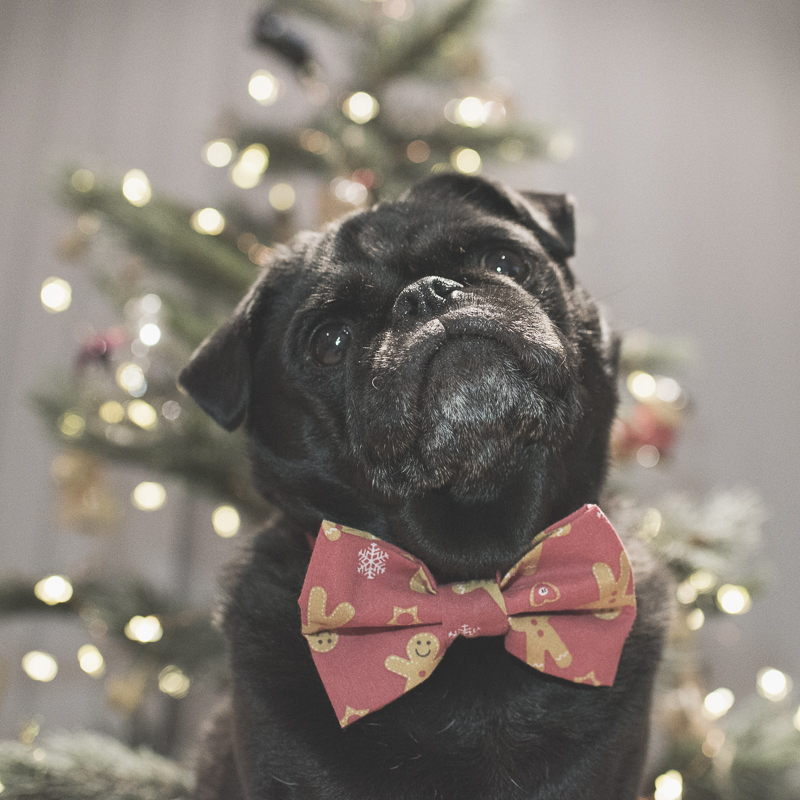 You may like to head outside to take your pug’s Christmas photos but if you are like me, I like taking them inside quite a bit as I find Ref & Serina are much calmer making it easier to take photos of them. The key to getting good photos of your pug inside though is making sure you have enough light so you can see them clearly without pixelating your photos. Choose a room that has lots of light. If you find that there are also lots of shadows, try hanging a shear piece of fabric like the white sheet or curtain to soften the light. Alternatively, if you have a room that has the sun shining through it in the morning, try taking the photos in it later in the day when the sun is not so strong coming through the window. There are many backdrops you can use to add some extra interest to your photo. It doesn’t have to be anything fancy either. You can try using some Christmas wrapping paper or fabric as a backdrop. 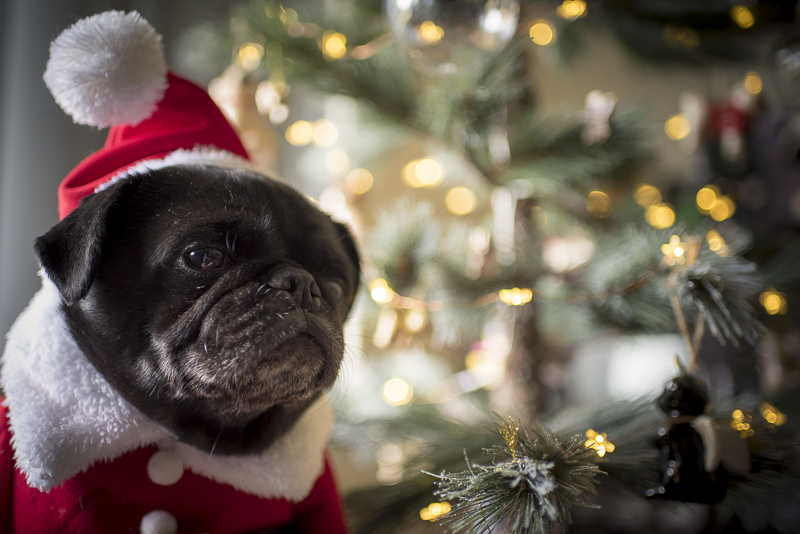 Get your pug to sit in front of the Christmas tree for an awesome background in your photos. You can even grab those extra Christmas lights you have tucked away and hang them on the wall for a pretty cool background. 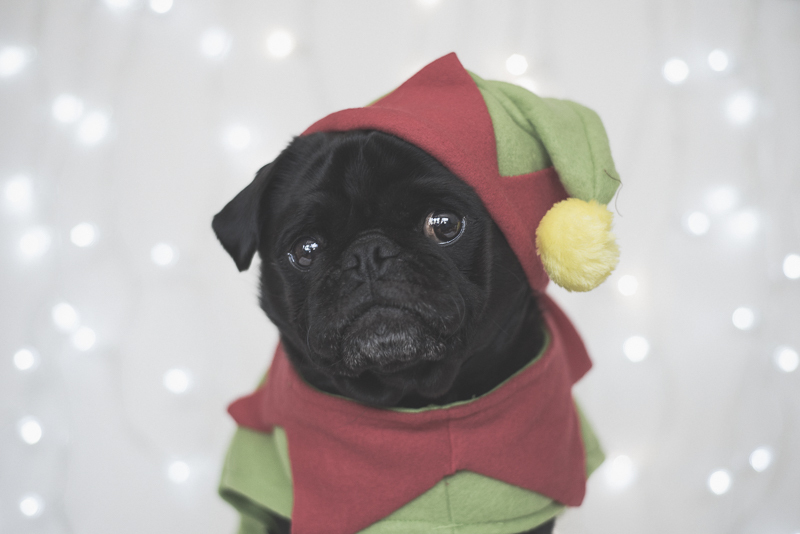 Keep in mind though when you are using Christmas lights, if you want the lights to have that cool blur in the background, you will need to have a bit of separation between your pug and the background and then make sure the camera’s focus is on your pug’s face. Props in photos can be a lot of fun and there is so much to chose from too. 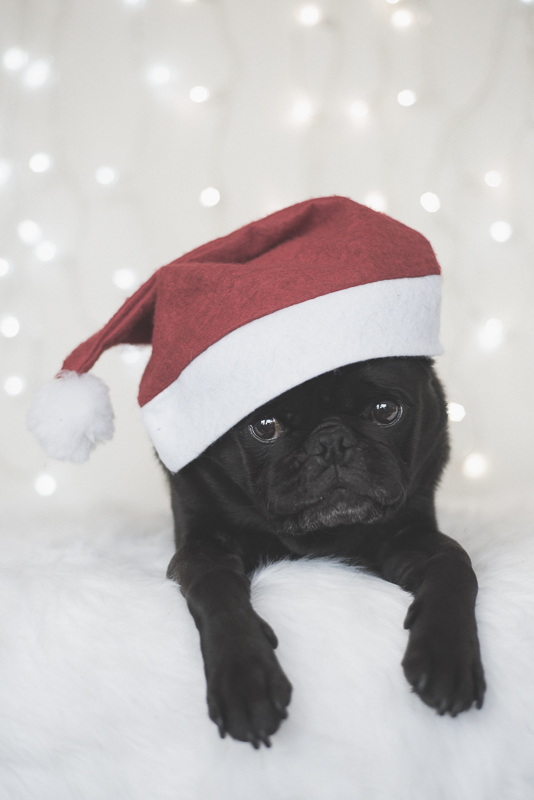 With the pet industry growing so much, you can go to your local pet store or department store and pick up a cute Christmas outfit for your pug to wear. I often see Santa outfits, deer antlers and for the ones who don’t like dressing up, bandanas and bow ties. All of these make great props for Christmas photos. You can even go for some other Christmas decorations like wreaths, tinsel and lights or bring a chalkboard in to share a Christmas message. 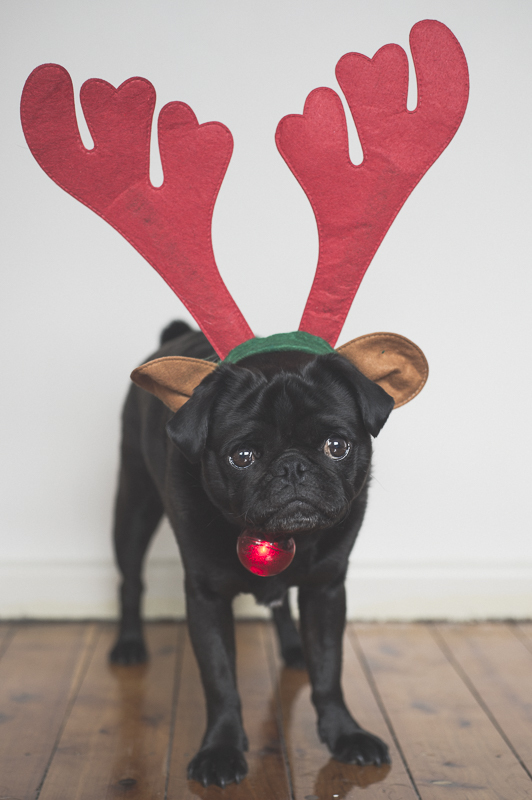 When choosing props for Christmas photos, make sure you know how your pug will react to them. If they don’t like dressing up, avoid clothing. If they chew on anything insight, don’t use tinsel of lights. Have treats and toys on hand. Nothing gets your pug looking at the camera then a treat or toy held just above the camera. Keep it short. 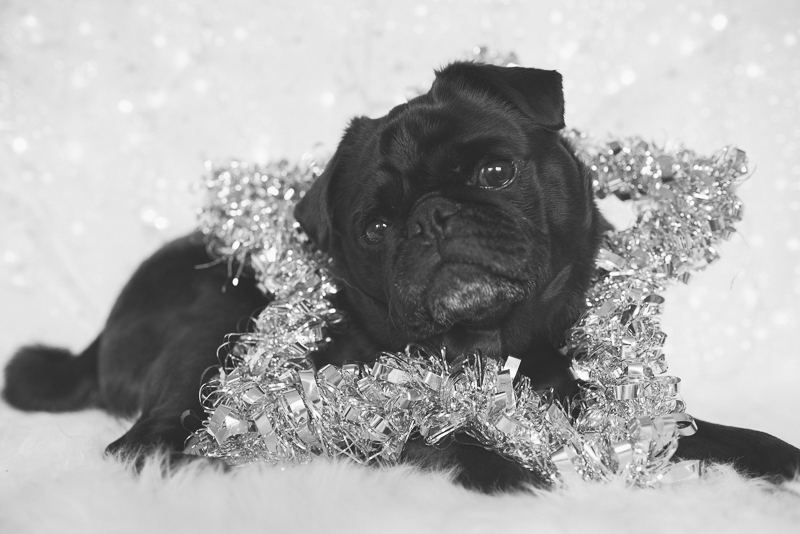 Limit your photo sessions to 10-20 minutes so your pug doesn’t get bored. If your pug doesn’t sit still in front of the camera, try sitting them on a chair or in a basket to get your photos. Reward them. 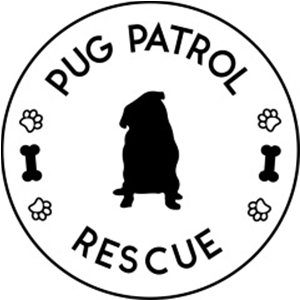 Once you have finished, reward your pug with their favourite toy, game, treat or take them for a walk. They will learn that having photos is fun. Take lots of photos. The beauty of digital photography means you can take lots of photos. Surely there will be at least one great photo there. 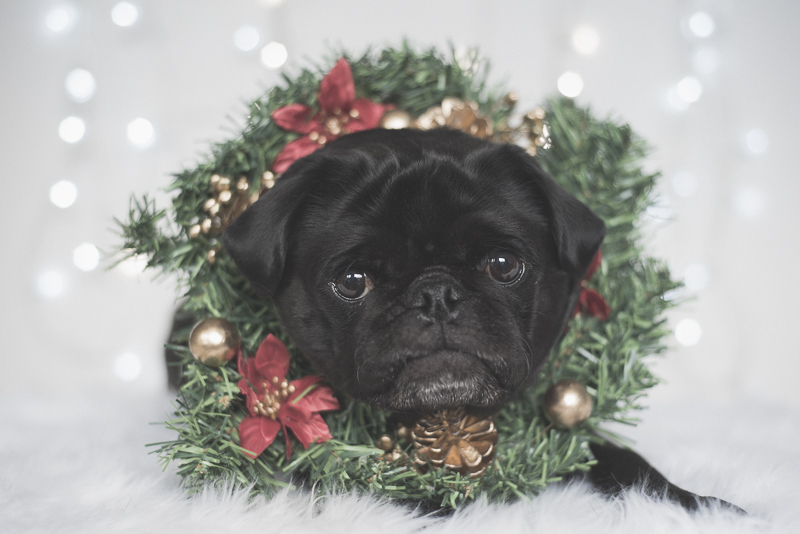 Christmas photos with your pug will be nice and easy when you use these 3 tips for taking Christmas photos of your pug. 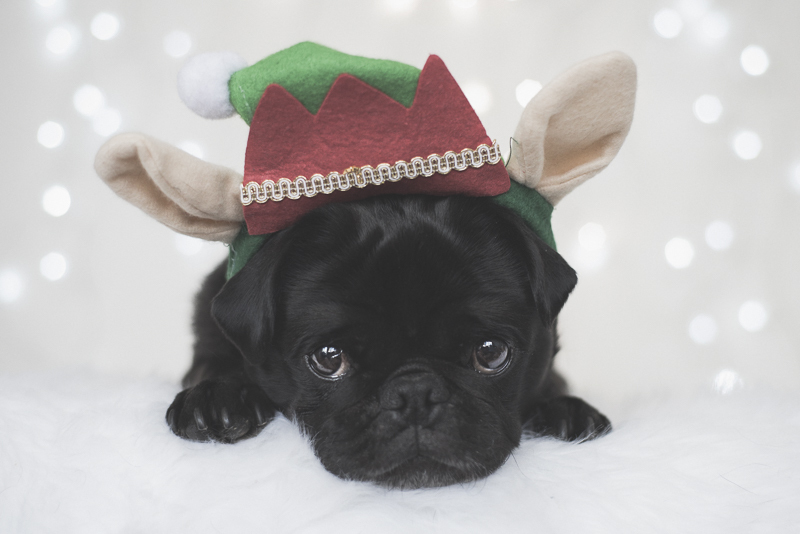 Enjoy the experience, reward your pug lots and share those awesome Christmas photos on Facebook and Instagram. 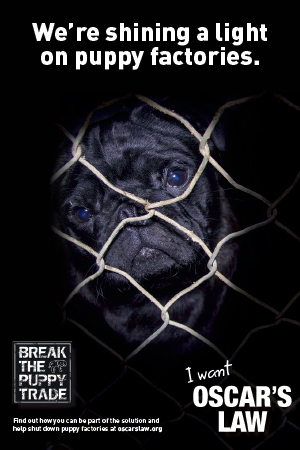 Use #thepugdiary on Instagram for your chance to have your photos featured on our Instagram account and post your photos to our Facebook wall so we can see them. Thank you Nina! I don’t have any experience photographing cats but with dogs, it is best to have them worn out with walk/playtime to make it easier to photograph them. I guess playtime could help with cats. Would love to know how you go trying that beforehand. Love it, awesome first post! I follow similar tips when taking photos of Jet Cavoodle. Congratulations. Thank you for taking the time to comment Belinda. I look forward to following your posts on IG and having a good look around your blog. Thanks for stopping by Madeleine! I look forward to hearing how you go with Wilma sitting on a chair for photos. If she likes to jump off it and doesn’t like to jump off higher things, you can always try a table or bench which may get her to sit still whilst taking photos. Also helps to take her for a big walk or playtime before photos so she is tired and more likely to sit still. Thanks for stopping by Claudia! Wrapping paper, whether it be Christmas or not, can make such a great backdrop and so cheap. Have fun trying these tips out. Thanks for stopping by Wita! A dog is the best thing to have in your life and not just for the dressing up. They truly are man’s best friend. Oh Ref! What a cutie! Some great tips for photographing family too – I often feel like I would like a treat after all the time spent taking the “same” family photo on everyone’s phone, camera and iPad! I guess that it can be applied to families too. I hadn’t really thought of it like that. Thanks for the lovely comment about Ref. And thanks for stopping by Cheryl. Hihihii, this was fun to read! And good tips 🙂 I will keep in mind, although I don’t own a dog, yet! But, I love to take pictures of stuff, so it might help me in the future. Thank you for the kind words and for stopping by Roswitha. And definitely these tips can be applied to objects although you won’t have to worry about getting them to look at the camera or them running away. Love your tips and you model is adorable….such patience! Thank you Caroline. We both have a lot of patience to do this. Ref doesn’t always do what I want him to do but he always puts up with what I put on him. For Ref though it’s for the love of treats as he gets reward with each mini session we do. Thanks for stopping by Andrea! I’m glad you found the tips helpful. Wrapping paper and fabric can be used at any time of the year for photos. Give it something fresh to the photos.